In addition to Mechanic Ranks, you can improve your persona on Gamestar Mechanic by obtaining badges, which track your achievements on the site. If you look in your workshop, you see two boxes labeled Gamestar Badges and World Badges. 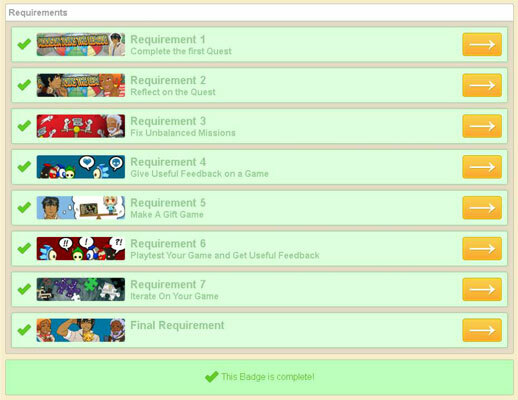 If you click the View All Badges button in either box, the Advancement and Achievements page opens. Scroll toward the bottom of the page to see details about your badges. The Gamestar Badges section contains all badges you’ve earned for your account. As you read from left to right and from top to bottom, the badges are listed in order by date earned, starting with the most recently earned badge. You may see grayed-out badges, indicating badges you’ve not yet obtained. The World Badges section shows your progress toward each world badge and offers you the option to start or continue your work on them. Red corresponds to designing games, matching the color of the dXP progress bar. Blue corresponds to playing games, matching the color of the pXP progress bar. Yellow corresponds to reviewing games, matching the color of the rXP progress bar. Orange corresponds to commenting on games or being a good citizen, matching the color of the cXP progress bar. Green corresponds to online learning, either the official courseware or the world badges. Bronze badges have brown icons and are the easiest to earn. Silver badges have gray icons and are more difficult to obtain than their bronze counterparts. Gold badges have yellow icons and are more difficult to obtain than either silver or bronze. Platinum badges have white icons and are the most difficult to obtain; however, few achievement chains go all the way to platinum. In addition, some badges transcend the 32, and these badges are available for only a limited time. 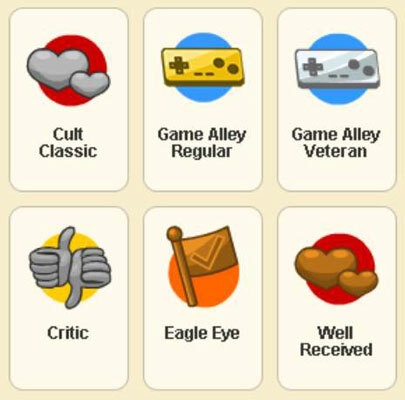 You obtain these badges by winning awards in various contests sponsored by Gamestar Mechanic, using games you’ve created in Gamestar Mechanic. You can scroll over these special badges, which are markers of your past achievements, to see what they represent. Fresh From the Oven Bronze Play a game that had 10 or fewer plays. Game Alley Cat Silver Play 500 games in Game Alley. Game Alley Newbie Bronze Play 5 games in Game Alley. Game Alley Regular Gold Play 1,000 games in Game Alley. Game Alley Veteran Platinum Play 2,000 games in Game Alley. On the Bleeding Edge Gold Play 300 games that had 10 or fewer plays apiece. On the Cutting Edge Silver Play 150 games that had 10 or fewer plays apiece. Try, Try Again Bronze Lose a single level 50 times in a row and keep trying. courseware and the world badges. Articulate Silver Leave 100 comments. played the second beta version of Gamestar mechanic. this badge only after the flag is reviewed and confirmed. Eloquent Gold Leave 500 comments. only after the report is reviewed and confirmed. Two Cents Bronze Leave a comment. Cactus Gold Publish 50 games. Cult Classic Silver Publish a game that at least 50 people have favorited. Level Designer Bronze Publish a game with at least 10 levels. Off the Charts Gold Have a game with more than 1,000 plays. Prolific Silver Publish 20 games. Published Bronze Publish a game. Sensation Silver Publish a game with more than 500 plays. Smash Hit Bronze Publish a game with at least 100 plays. The Chosen One Gold Have one of your games featured by the administrators. Critic Silver Review 100 games; each review must have some text in it. Critical Eye Bronze Review a game. Reviewer Gold Review 500 games. Each review must have some text in it. Background Certificate Gold Complete the Custom Backgrounds challenge. League Intern Silver Complete the introductory missions in the Quest. League Mechanic Gold Complete the first five Quest missions. 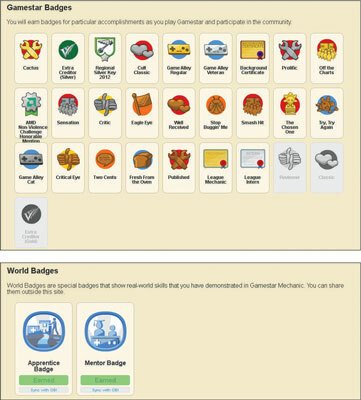 World badges take much longer to earn than Gamestar badges because you have to complete a series of tasks. When you click Start Now or Continue in the World Badges section, Gamestar Mechanic shows you the list of requirements to earn that badge. Clicking the orange arrow button on the right side of an unlocked requirement shows you a brief description of that requirement. 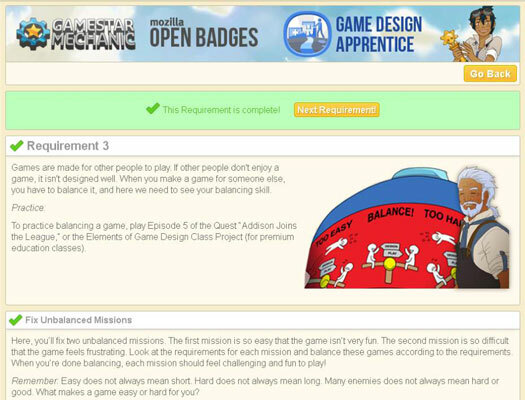 For example, click the orange arrow to the right of Requirement 3. You will see this page. This briefing tells you exactly what you have to do to fulfill the requirement.